THE SUPPORT THAT EVERYONE HAS GIVEN + POOL TO ACHIEVE OUR GOAL WITHIN THE FIRST 6 DAYS HAS BEEN ABSOLUTELY INCREDIBLE. THANK YOU. IT'S BEEN SO ENCOURAGING AND OVERWHELMING (AND SO QUICK) THAT WE'RE HOPING TO KEEP MOVING TOWARDS OUR NEXT MILESTONE OF $50,000. AFTER ALL, WE STILL HAVE SO MUCH TIME LEFT MIGHT AS WELL KEEP GOING! + Pool is our initiative to build a floating pool for everyone in the rivers of New York City, and we need your help. We've spent the last year working with engineers, swimmers, consultants and planners studying what it would take to swim in clean, natural river water right here in the city. Now with your support here on Kickstarter we can bring + Pool one giant step closer to the water. We started + Pool last June, during what seemed like one of the hottest summers of our lives. As a New Yorker, you spend most of your time on an island surrounded by water, and when it gets as sweltering hot as it does in New York, you naturally start fantasizing about swimming in the river. But the rivers here aren’t the cleanest and swimming in them isn’t necessarily the best idea. We wanted to do something that could change that. So we proposed a pool. More specifically, we proposed a pool that uses and filters the very water that it floats in. 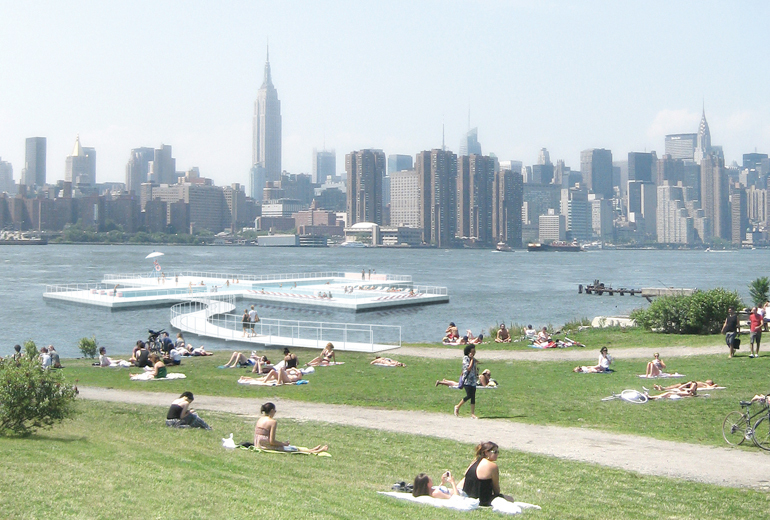 A pool that makes it possible to swim off the shores of New York. In river water. That’s clean. During that summer we designed + Pool and launched it into the world with the main intention of building a team that could help us realize the project. We figured it might attract attention from some engineers and experts that could help us out. What we hadn’t anticipated was that within the first few days over 50,000 people had shown interest in the project and we were fielding calls left and right about how to make this pool a reality. At the end of the first week, we got a call from Arup, one of the most innovative engineering firms in the world (and frankly, a firm we never thought we’d even get a chance to talk to) who basically said, “look guys, you've got something new here, and we want to help you make it happen.” Arup offered to donate their resources and it was at that moment that we realized that this thing was really going to happen. 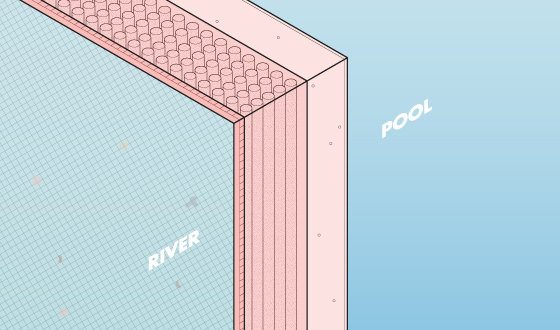 The most important aspect of + Pool’s design is that it filters river water through the pool’s walls - like a giant strainer dropped into the river. The concentric layers of filtration materials that make up the sides of the pool are designed to remove bacteria, contaminants and odors, leaving only safe and swimmable water that meets city, state and federal standards of quality. This pool will be the first of its kind, which is of course very exciting, but really we just want to be able to swim in the river. We wanted the + Pool to be enjoyed by everyone - at all times - which is why it is designed as four pools in one: Children's Pool, Sports Pool, Lap Pool and Lounge Pool. Each pool can be used independently to cater to all types of swimmers, combined to form an Olympic-length lap pool, or opened completely into a 9,000 square foot pool for play. We launched + Pool in June of last year and garnered a surprising amount of public and private interest. We met with interested swimmers, designers, engineers, community organizers and consultants to build a team to develop the project. We spent the last year talking with local cultural, developmental and environmental groups, learning about the waterways and refining the social and ecological performance of the project. We’ve talked with municipal and civic organizations to find out what kinds of permitting and approvals we’d need to get + Pool into the river. We teamed up with Arup and spent the winter studying water quality, structural configurations, energy use, site potentials and of course the filtration system. Arup helped us understand the state of New York City’s waters and what the pool needed to do to achieve our desired level of water quality. At the end of May, we received the final feasibility report from Arup that essentially said "yes, this can happen, and here’s how." Now we have to test it. We’re looking to raise $25,000 to begin physical tests of the filtration materials and methods that we spent the winter studying. With each donation amount you'll receive an article of + Pool summertime attire, from tantoos and koozies on up to sunglasses, tanktops and towels. 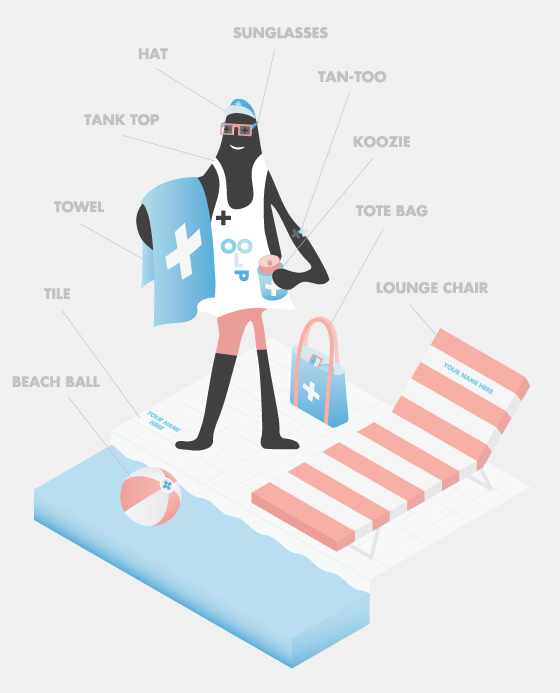 A $500 donation will get you the entire outfit complete with a handy + Pool tote bag to tote your new outfit around. Give more than that and you'll not only become a proper Sponsor or Partner of the pool, but we'll engrave your name onto a piece of the pool itself. Your name will become a permanent fixture on what we'd like to imagine will be a defining icon for ecological innovation in New York City. You + Pool. Our ultimate goal for this phase is to build a full scale mock-up of the + Pool filtration wall so that we can prove to the city how real this thing actually is. Material testing sure is pricey, but the more money we can raise here, the closer we are to getting + Pool in the water. $25,000 - We can test the Primary Filtration Layer: a geotextile that is both the first and most crucial layer of the filtration assembly. $50,000 - We can test the Secondary Filtration Layer: different membranes that make up the most complex section of the assembly. This is basically the meat of the filtration sandwich. 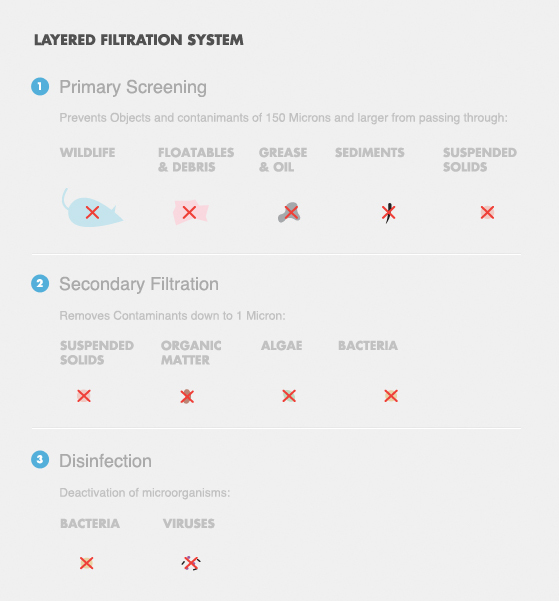 $100,000 - We can test the Third Filtration Layer: Innovative disinfection methods that are clean and safe for both swimmer and river. No point in just dumping a bunch of chlorine into the pool if it's going to flow back out into the river! $250,000 - We can develop and design the full water-cleansing assembly and find the most suitable structural, mechanical, electrical and of course filtration systems to get only the best out of the river. 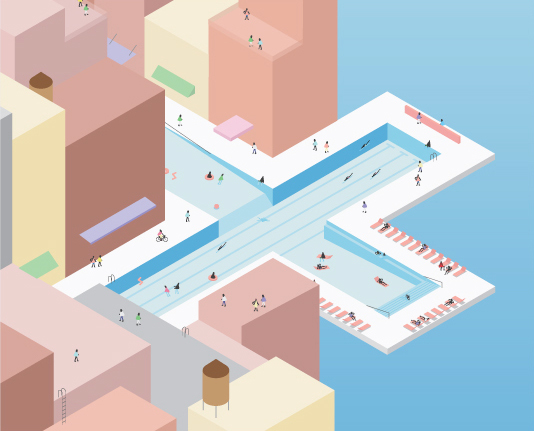 $500,000 - We can build a full-scale mockup of a piece of the pool, water filtration and all, to present to the public, to the city, to everyone. We will also piss ourselves a little because oh my that would be incredible. Thank you to GYLo for the video up there, and thank you so much for believing in and supporting this. 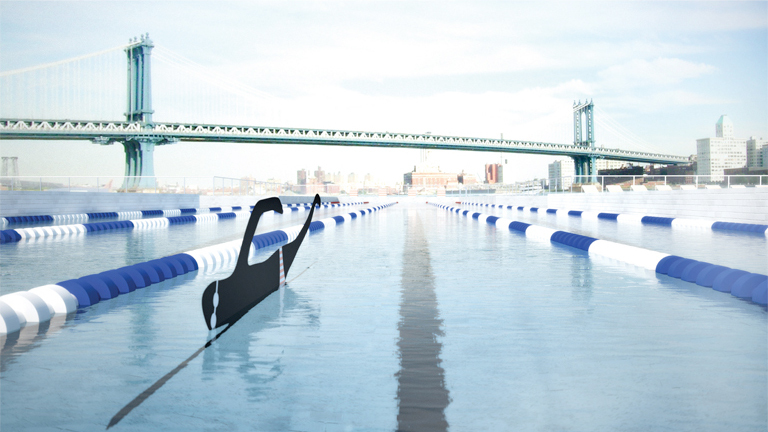 We hope that all of us will be swimming in a plus-shaped pool in the rivers of New York very soon. We're really excited about this project. A BIG THANK YOU and your name on the "Buddys of the Pool" donor list. 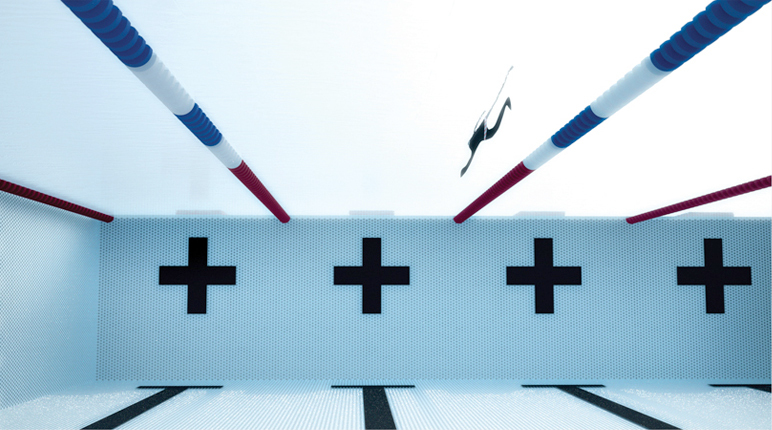 + POOL SPONSOR. A pool tile engraved with your name to make a piece of the pool yours, as well as everything above and your name on the "Sponsors of the Pool" donor list. + POOL PARTNER. A poolside lounge chair adorned with a plaque engraved with your name, as well as everything above and your name on the "Partners of the Pool" donor list.